Used game sales have long been a thorn in the side of game makers, and Forza 3 developer Turn 10 Studios has decided to strike back against the GameSpots and Game Crazys of the world. All new copies of Forza 3 will contain a single-use code redeemable for a free download of the "Motorsports Legends Car Pack." Far from a simple "thank you" to fans for their monetary support, the Pack includes ten classic cars and two racetracks. The Benchmark High Speed Ring is best described as an old airfield and hangar converted into a race track and automotive playground, perfect for all manner of creative "Forza Motorsport" hoonage and multiplayer mayhem. The track is characterized by 3.96 miles of rough surfaces and huge open areas, featuring a massive oval, an 8-lane drag strip, and an airplane hangar that players can drive (or drift) through. And how exactly does this stick it to used game resellers out to screw both consumers and content creators in the quest for the almighty dollar? 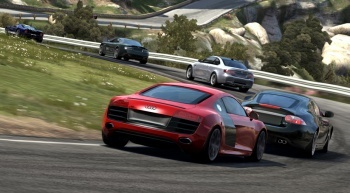 Turn 10 believes gamers, if presented with the choice between a slightly cheaper used copy without the Motorsports Legends Car Pack and a more expensive, new copy with the Pack, will opt to hand their cash over to Microsoft and Turn 10, instead of the money-grubbing suits who run your local game retailer. I've got my fingers crossed that it works too. I spent years working in gaming retail and the only thing I learned is that used game retailers may as well club the eyeballs out of baby seals for fun for all their unethical, essentially evil ideals. While those of you who doubt may call this "hyperbole," I call it "my district manager had glowing red eyes and spoke entirely in Aramaic."